In the Soviet period speed ascent competitions on Elbrus slopes — from Mir station till Garabashi station and from Priut 11 till the col — were the part of training program for the members of the soviet Himalaya expeditions (1982, 1989). Elbrus was well-known for all seriuos Soviet mountaineers, as the mount's location is very comfortable and its height is enough for the race. It was considered to be a prestigious action — to take part in these races, and the strongest USSR climbers had competed there. Now the Mount is the object of the International program «7 Summits» (climbing the highest tops of all continents). Elbrus is especially lucky nowdays — in spite it is the part of Caucasus, one can reach its bottom without special frontier guard's permit, the way along Baksan valley is comfortable and safe. Hotels in Terskol, Bochki huts, Priut 11 and the new modern hut some meters higher than Priut — do Elbrus climbs more and more comfortable, and from day to day a lot of groups go to their dream — Elbrus tops. But, exept some events — all of these climbs are of «tourist class». But 15-20 years ago those slopes were the place for serious mountaineers ambitions battles! Vladimir Balyberdin was the first who had understood the annual Elbrus speed climb Championship perspectives. In 1987 he organized there the first Fall Elbrus Race — from Priut 11 till the col. September was not the occasional choose – it is the best season here. There is no ice on the route usually in September, and the whole way to the tops is more safe than in other seasons. Next races were in 1988 and 1989. Anatoly Boukreev is a legend of that Races — he won in 1990 — and his result was 1 hour 47 min (Priut 11 — East top). Taking into consideration the increase of the popularity of extreme sport and mountaineers quantity in Russia and CIS last years, the accommodation convenience in Elbrus region, the experience in organization of sport events and experienced mountain guides, Russianclimb.com and Top Sport Travel (high venture travel company, led by Nickolay Shustrov, Master of Sports in mountaineering, member of Balyberdin climbing team, 1990 Elbrus race participant with 5-th result (2h12min), Camel Trophy 93 participant) decided to reborn the tradition of speed climb competitions to the highest Europe point. September 15, 2005, Mt.Elbrus Speed Climb (Elbrus Race) took place. The Race took place September 15, 2005. Detailed weather forecast the week before the start showed that in the race day the weather should be fine, with weak wind. September 15 at 3-30 a.m. the weather on Elbrus was wonderful! The clear sky was covered by stars, it was warm enough and about no wind. 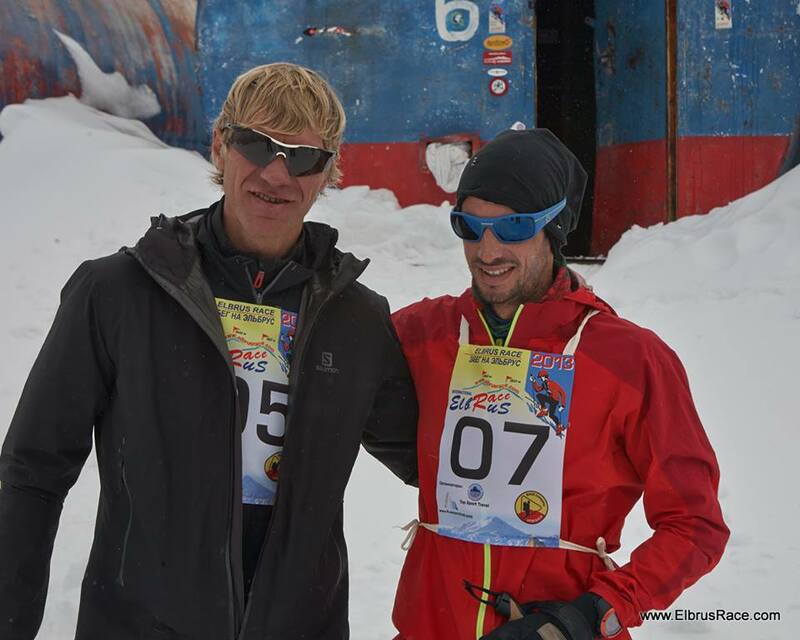 If it is an ideal place and time for each event, this time was such for the Elbrus Race. Serguey Bogomolov and Valentin Bazhukov — veterans, who remember better Elbrus ages, greeted competitors and organizers of the Race, said some words about the important and perspective role of such event. Russian mountaineering as a sport is not so strong last years as in former USSR, and such races may become the stimulus for sport ambitions. At 4 a.m. Top Sport Travel guides team (time and safe route control), with warm clothes, tents, stoves, hot tea, headlights, medical kits, boots for atletes — for the descent, some climbing gear, video- and photo cameras and so on… — started by SnowCat and went to Pastukhova rocks, and further reached their positions at the route. Caucasus demonstrated all its beauty that morning on sunrise — in clear air one could find all peaks, as in Geographic atlas — from Tjutju Su to Nakra — Dzhailyk, Adyr Su, Ullu Tau, Koshtan Tau, Dych Tau, Chatyn, Bzheduh, Shkhelda, Ushba — all high 5000-m peaks and not so high lies around — the great panorama without any clouds. The route was good. For the beginning — the SnowCat track to Pastukhova rocks, 4650 m. Athletes could run without crampons, in cross shoes. Further, the traverse trek on East top slope till the col was also good. But there was cold already. Mikhail Osipov (born in 1979, lives in Prokhladny town) was the first who reached the West top of Elbrus — his time was 4 hours 10 min. Vladimir Yakimov (born in 1956, lives in Sosnovy Bor town) went just after him to the col. But he felt bad there. Got the first aid, he decided to turn back and began to descent guided by Alexey Tyurin. Two women — Vera Ponarovskaya (born in 1957, Prokhladny town) and Vilena Korzhuk (born 1970, Rovenjki town) at the traverse turned back and helped Vladimir too. Guides called for SnowCat, which arrived to Pastukhova rocks, and soon the group was at Bochki huts (Garabashi) — thanks to the Head of Elbrus region rescue service Boris Tilov. Vladimir was fine soon. After that, Vladimir Kuznetsov (born 1956, Samara) reached the top, all competitors and guides descended to Bochki huts, where Race' members were awarded by certificates and prizes from organizers and sponsors ( RED FOX, OUTDOOR -CENTER TRAMONTANA, EX magazine). The Winner of the first official Elbrus West Race Mikhail Osipov was awarded by Cup. All members of 2005 Race can run in 2006 Race without qualification start. Guides team worked well. Time and safe control at the route was managed by Oleg Demidenko, Alexey Tyurin, Dmitry Drachev and Alexey Gorbatenkov. All of them are the experienced mountain guides, who climbed Elbrus many times and guided a lot of groups there every year. Medical control before and during the race was provided by specialists from Center of athletes's health searsh (Sochi). Elbrus Race will be the annual event, beginning from 2005, in the middle of September. Application form for 2006 Elbrus Race will be published in special Internet site soon. We invite climbers, skiers and other athletes from any countries take part in Elbrus Race 2006, and suggest to National and Regional Mountaineering Federations to think about preparing athletes (teams) from their states (cities, regions) for the competition. Organizers, in their turn, will do their best for Elbrus Race-2006 would be more comfortable and safe, and begin now to cooperate with sponsors for forming the prise fund in the different nominations. We were very pleased for the Race's support for sponsors RED FOX, OUTDOOR-CENTER Tramontana companies, Ex magazine, and also Elbrus region Administration and Saint Petersburg Administration, Bochki huts and hotels administration, Elbrus region Rescue Service, and Sochi Medical Centre. We invite the interested organizations to take part in next Elbrus Race in September 2006.